YOU GET a pack of 11 unique professional Jet Plugins for drag-n-drop Elementor page builder, over +30 demos, more than +1000 pre-styled sections, as well as +300 unique pages, 8 gallery layouts, header and footer builder, premium support, fast updates, a professional image pack, development guarantee and much more! Originally IT COSTS $79 per year or $299 for a lifetime subscription. What’s the best way to share information in the Age of total globalization? Surely, a website! Wow, I noticed a gleam in your eyes. With it, you’re able to unleash your imagination and make your own ideas go live… However, when one’s looking for the right way to approach the task of creating a personal website, the process might seem too complicated. So many people have refused from creating a website because it was obvious to them, that one cannot build anything worthy without coding knowledge. But don’t feel disappointed, as here is CrocoBlock service, that makes it possible for YOU to create your own brand-new website without any difficulties! Isn’t it great? CrocoBlock is a powerful service, which provides you with everything you ever needed to create a site in WordPress. You might have already heard of it, yet, in case you have any doubts if it’s really that easy to create a site using it, this quick guide through the most frequently asked questions is just for you! What is Elementor? Why might I need it to work with CrocoBlock? Elementor is a free frontend page builder plugin for WordPress. More than +1,000,000 people use it. It allows to easily add widgets to build pages in a drag-n-drop way, which are in reality like the building blocks of your website. With Elementor you do NOT need any coding knowledge to construct a website. CrocoBlock is based on Elementor and boosts it by means of extra plugins and addons with powerful functionality. Do I need to purchase Elementor PRO to use CrocoBlock? Elementor PRO is an advanced version of Elementor. It has more sophisticated features and modules. 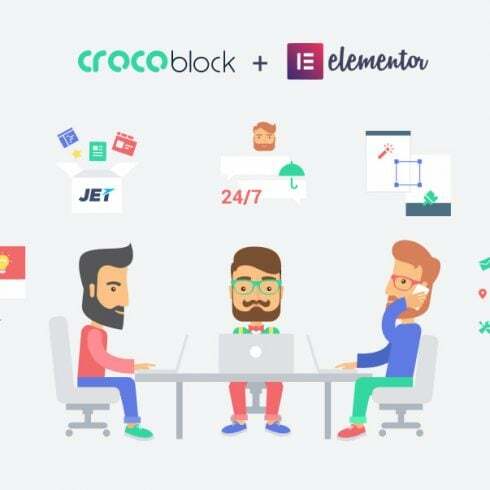 You do NOT need to purchase it, since CrocoBlock products fully substitute most of Elementor PRO’s features, and the service adds even more. 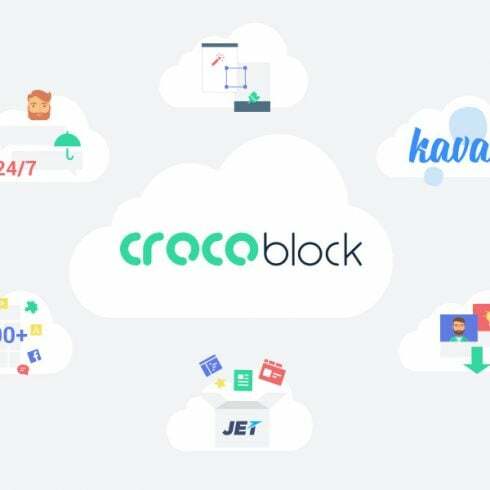 Just think of it: with the CrocoBlock subscription, you get 11 high-quality plugins, the fantastic Kava PRO package, the eye-catching demos, 24/7 caring support, regular updates, the professional images pack, a development guarantee, etc. However, when you’re using Elementor PRO, CrocoBlock can still add some unique functionality to your website. What plugins are included in the subscription? What do they do? There are 11 unique plugins created by the CrocoBlock team. JetElements plugin is a perfect multipurpose tool when it comes to creating content. There are more than 40 widgets, such as portfolio, animated text, post slider, comparison, advanced map, posts and so on. JetMenu comes to assistance whenever you want to create a menu filled with the diverse content. There are also a lot of customization settings. JetBlog plugin consists of 4 top-notch dynamic widgets with the help of which you can display the content in a stylish way. There are a smart list widget, a smart tiles widget, a video playlist and a text ticker widget. JetTabs plugin provides one of the most stylish and smart ways to organize your content. JetReviews has various content and style settings, allowing to create review blocks with different layouts. JetTricks plugin helps to make your content alive with magnificent visual effects. It gives you an opportunity to use the Parallax Effect for columns, make separate elements “sticky”, set “hotspots”, etc. JetWooBuilder plugin is a perfect booster to the WooCommerce plugin, which makes a shop out of your WordPress website. It provides you with powerful widgets, such as Products Grid, Taxonomy Tiles, Single Rating, Single Related Products, Single Add to Cart and much more. You have a choice whether to build your own single product page layouts and product archive pages, or use the ready-made layouts. JetBlocks comes in handy when you create headers & footers. It includes 9 widgets: Site Logo, Auth Links, Login Form, Registration Form, Hamburger Panel, Search, Shopping Cart, Breadcrumbs and Nav Menu. But what makes CrocoBlock really exquisite is the ability to make the section “sticky” without even touching a single line of code! These sections will move along with you while you scroll the page up or down. JetThemeCore plugin provides you with the Magic Button, which gives you access to the collection of pre-designed pages for different needs, pre-styled headers and footers, separate sections, archive and single post pages and so on. JetEngine plugin provides functionality for creating custom post types, custom meta boxes for any kind of content, custom taxonomies. With the help of this plugin you can easily display team members, services, create portfolio layouts without any skills in PHP and CSS. It consists of 6 extraordinary widgets for pulling dynamic content from the posts and displaying it on the web pages built with Elementor. JetPopup plugin allows to create popups, style them up and set their location. The popup is used for different purposes: to subscribe, to provide a discount, to deliver some important information and so on. Choose the animation effect – and voila! All of these plugins are the priceless addition to the Elementor builder, and your website. What is Kava theme? Is it free? Kava theme is an easy-to-use, fully-responsive FREE theme, which has literally everything to create a website from scratch. Our designers worked hard on this theme’s sophisticated appearance. Kava theme’s performance is smooth due to its loading speed of 0,9s, and it’s also almost weightless (only 250kb). Its potency can be represented in numbers: along with Kava theme you get 50 blog layouts, 10 single post templates, there are more than +200 customization settings and over +100 hooks. Kava Pro is an expanded all-in-one version of Kava theme. After you buy the subscription you get a pack of Jet Plugins, over +30 skins, more than +500 pre-styled sections, as well as +300 unique pages, 8 gallery layouts, premium support, fast updates, etc. You become wholly ready for almost anything! Are the skins and templates compatible with other themes but Kava theme? The CrocoBlock team has already designed 35 skins. Each skin consists of the set of pre-made pages (Home, Contact, About, Services, etc.) that can be used and applied by you to your site. Customize them according to your needs and start using them in a few clicks! In case you want to add a page from another skin, just click the Magic Button! And, YES, any skin and any template can be used within any theme for WordPress. There is no need to use Kava theme in the case you are quite content with the theme you’ve been using. How often are the updates made? How often do new skins come out? The CrocoBlock team works a lot to meet the highest requirements and grow the service. Along with the subscription you get weekly updates. To get the detailed information on the latest improvements, click here. Now you can see that skins are released every week! What is the difference between CrocoBlock subscriptions? There are two pricing plans available at CrocoBlock: the Annual and the Lifetime one. The Lifetime subscription, which costs $299, provides you with the same features, but forever and a day. Also, there is a pricing plan for those, who want to try CrocoBlock and decide if it is the right service for you. It costs only $49 and allows you apply all the product only to one website. Thereafter, you can change your pricing plan by only paying the difference in case the license hasn’t expired yet. Also, from time to time CrocoBlock offers the discounts. So, don’t miss a chance! What happens when the CrocoBlock license key gets expired? In case the license key gets expired, your site will keep working. You will also get the updates for Kava theme and all the plugins, except of the JetThemeCore plugin. However, you will not receive pre-designed sections, demos and new plugins anymore. The technical support will not be available as well. The CrocoBlock subscription service is suitable for developers and non-developers, regardless of your experience. It makes possible to create websites from the very beginning, supplying you with everything you need and even more. Do it the way you like and CrocoBlock team will take care of your comfort.